SOME of Woking’s hidden gems opened their doors to the public on the weekend as part of the nationwide festival Heritage Open Days which celebrates the country’s history, architecture and culture. The once-a-year opportunity is part of Woking Borough Council’s Celebrate Woking initiatives and included Woking Palace, the final opening before it closed for the season, and the Shah Jahan Mosque, the oldest purpose built mosque in Britain. Woking Palace was open on Saturday and Sunday and guides gave free tours around the eight acre moated site at its beautiful riverside setting where there were a number of displays that gave an insight into Tudor life and leisure activities. The palace was once a large and palace used by Henry VII through to Queen Elizabeth I. Excavations over the past few years have uncovered evidence of the rich hunting and feasting that took place in the Royal Park and palace. 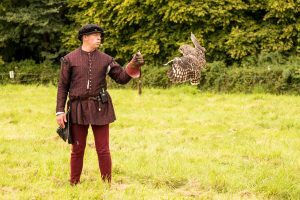 Displays included falconry period storytelling, period melodies on replica Tudor Instruments as well as performances by juggler, Hattie Hyder, who was also offering free tuition. The Shah Jahan Mosque held its annual Heritage Open Day on Saturday afternoon, giving tours of the beautiful Mosque, historical talks, Islamic exhibition as well as refreshments. Widely regarded as being at the centre of Britain’s Islamic heritage, it was commissioned by Gottlieb Wilhelm Leitner to provide a place of worship for Muslim students at the Oriental Institute and opened in 1889. A Grade II listed building, it has a traditional Indo Saracen design has a dome, minarets and courtyard. The mosque provided guided tours, exhibitions and refreshments to visitors.